Sorrel soup with potatoes. Recipes from Russia. 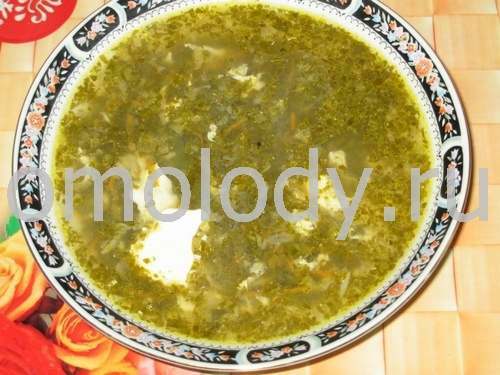 Sorrel soup is very popular soup of Russian cuisine. It is very rich with vitamins and will be the perfect main dish. 200 g (8 oz) chicken. 1. Cook meat in the boiling water until done. Add cubed potatoes and cook until tender. 2. Chop very fine the Sorrel, chop greenery and onion. Put into boiled broth. 3. Add beaten egg, stirring very carefully, (or you could to use cubed boiled egg). I would recommend that you season the Sorrel soup with 1 - 2 Knorr Chicken Bouillon Cube dissolved in 1 1/2 cups Hot Water. 4. Cook 1 - 3 minutes. Turn off heat. 5. Serve with meat and sour cream.